An unknown printer error has occurred. Turn off the printer and leave it off for several minutes; then turn on the printer again. If the error recurs, contact your dealer. The print head is overheated. Wait for a few minutes; the printer resumes printing automatically once the print head cools. A single sheet of paper is not fully ejected. Press the Load/Eject button to eject the sheet. Continuous paper is not fed to the standby position. Tear off the printed page at the perforation; then press the Load/ Eject button. The printer feeds the paper to the standby position. The paper release lever is set to the wrong position. Set the paper release lever to the position for the paper source you want to use. No paper is loaded in the selected paper source. 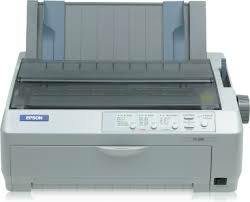 Load paper in the printer or select a different paper source; the Paper Out light goes off. Then press the Pause button; the Pause light goes off and the printer starts printing.